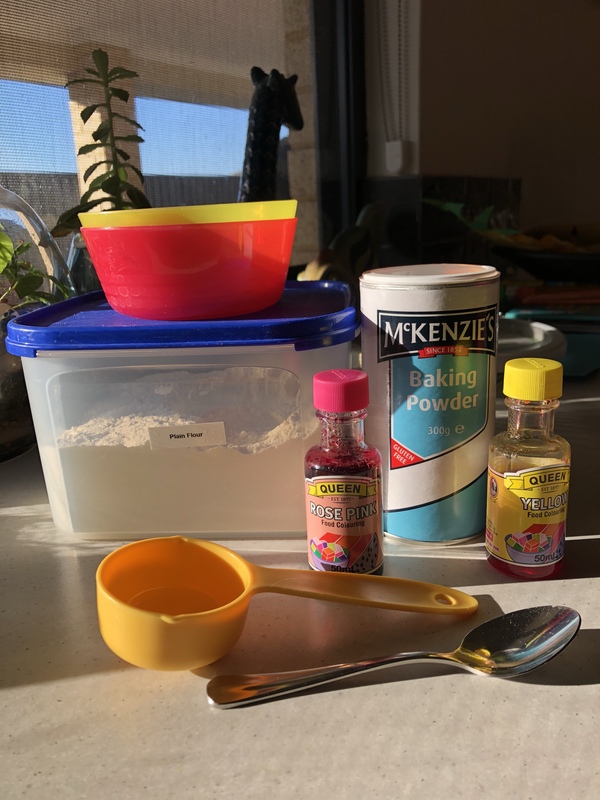 Miss 4 had an interest in baking today however having spent the day in the kitchen yesterday, there is just not enough room in our freezer for another batch of anything! 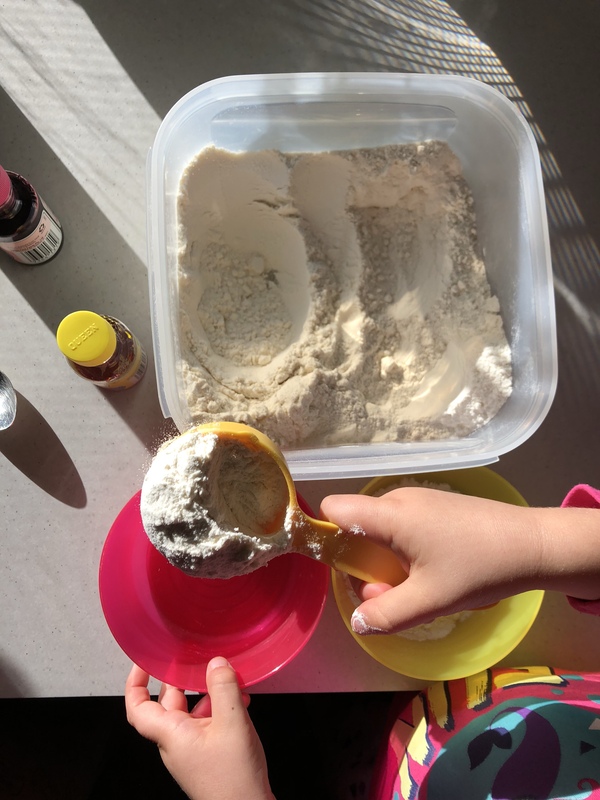 Quickly my mind was running over sensory play activities that I could claim to be ‘baking’ that would satisfy her craving without wasting to many ingredients. 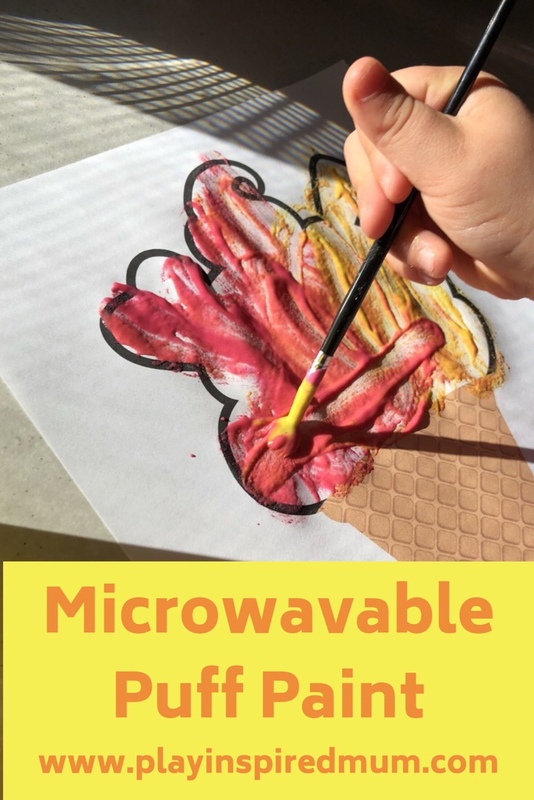 One of her paintings from yesterday was laying on the bench and the idea came to me – Microwaveable puff paint! I had heard of it through the grapevine, it seemed simple enough and so we gave it a shot! 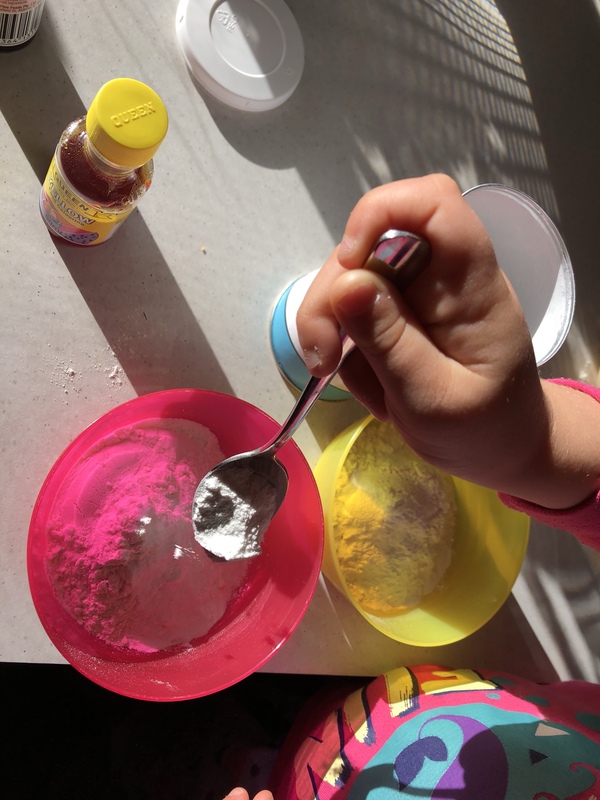 It only took a couple of minutes for Miss 4 to mix a few pantry ingredients together to make our paint. Are you going to give this a go? 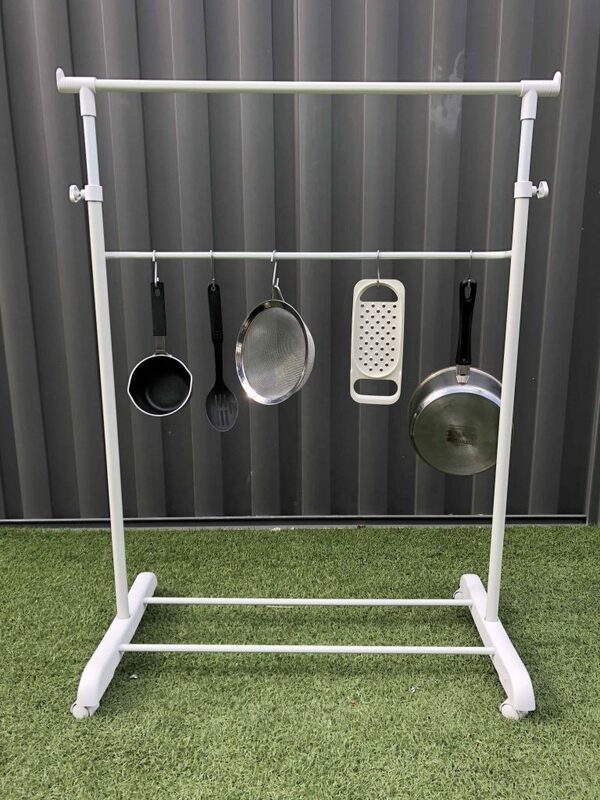 This is all you need! 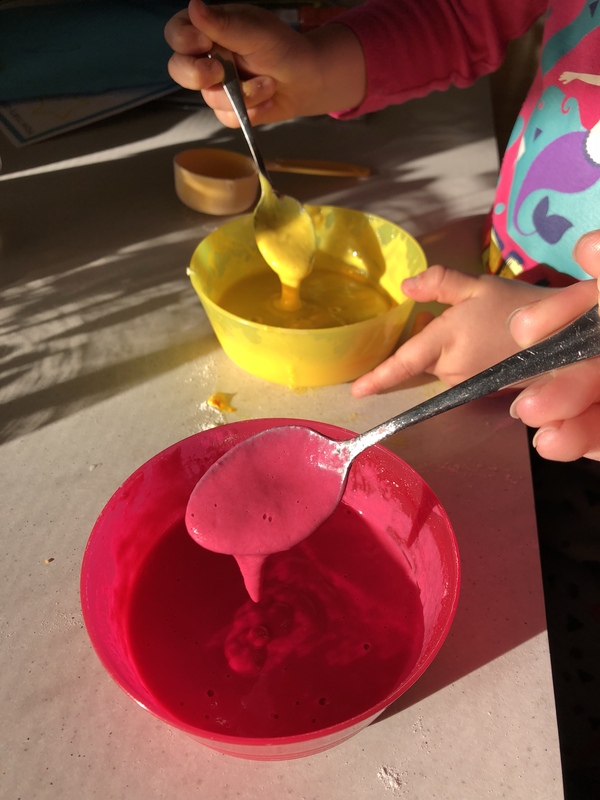 We decided to make two colours, so we set up two bowls. 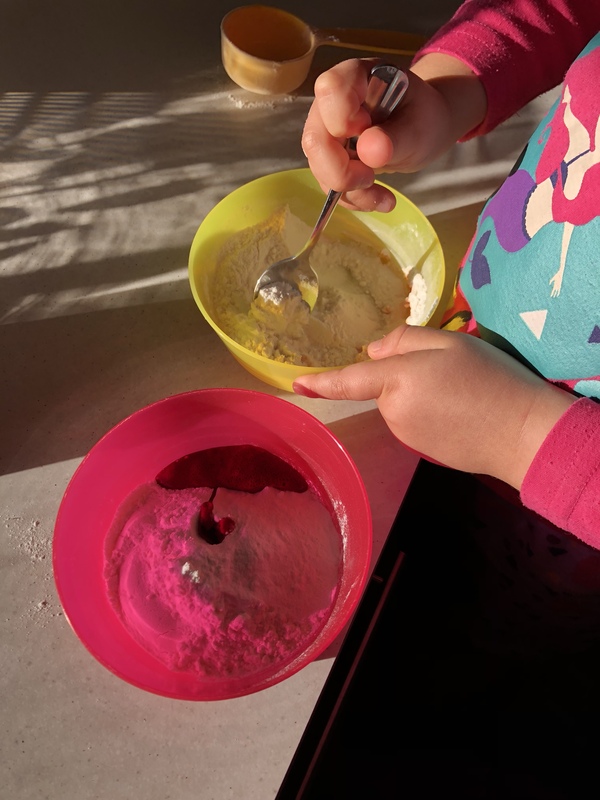 To begin mixing our Puff Paint, Miss 4 measured out the flour and baking powder into each bowl. 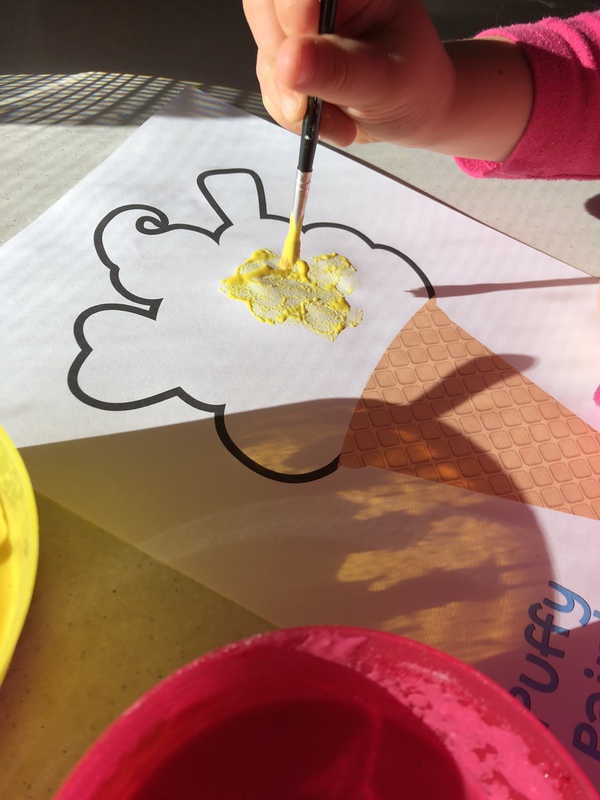 It was then time to add the colouring and we were not expecting the reaction that we got! 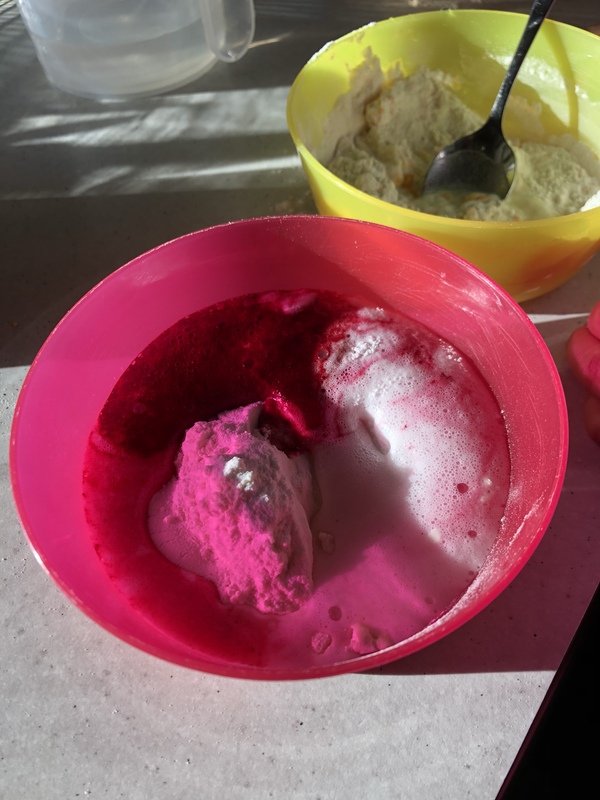 The Food Colouring reacted with the Baking Powder which created a hiss of bubbles as it seeped across the top of the dry ingredients. It certainly added some exciting theatre to the play! After watching the sizzle fizzle out we poured a splash of water into the dry mix. Instantly this seemed to reignite the reaction again and we were again entertained with hisses and bubbles. 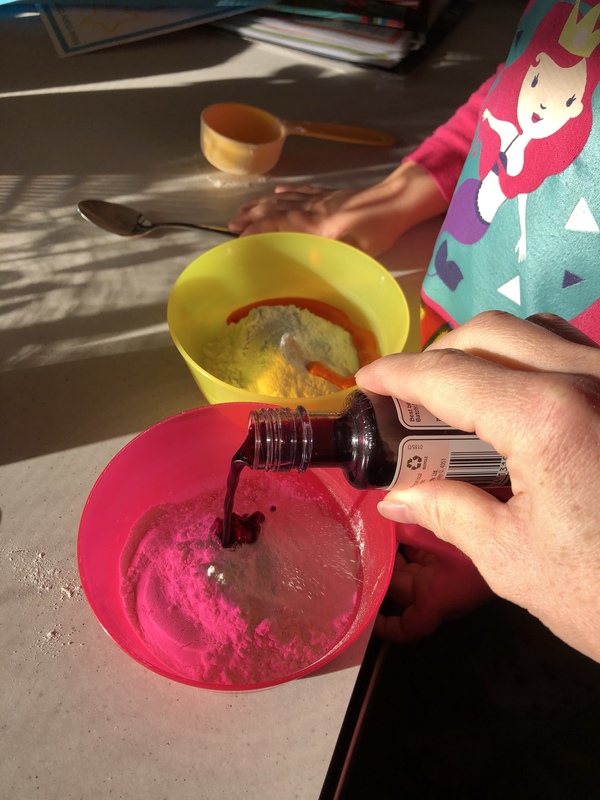 Miss 4 and I were chatting about different chemical reactions and how we were lucky that this was a safe one. She was brimming with questions, like I imagine most 4 years olds are. 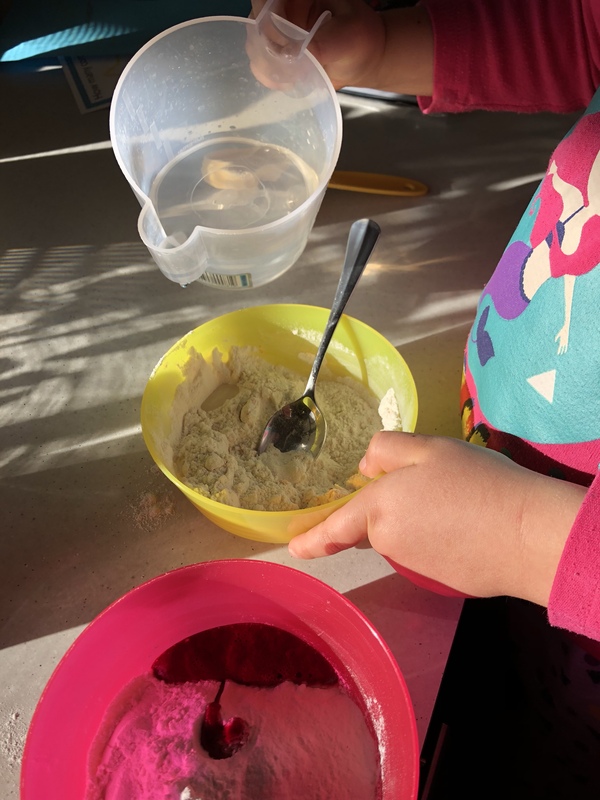 Once Miss 4 was satisfied with the answers I gave her, we continued stirring in splashed of water until the mix was smooth. 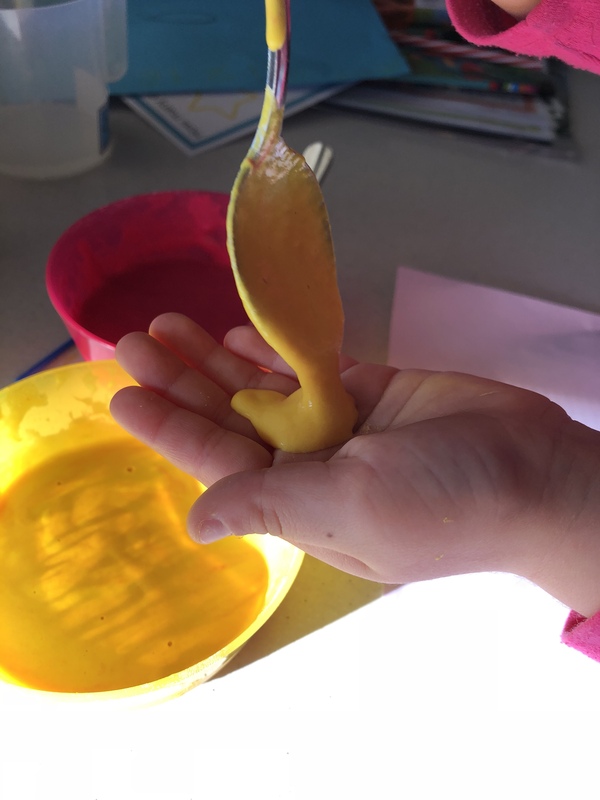 We kept it relatively thick so it fell from the spoon in blobs rather than free flowing. I placed the bowls on Miss 4s left hand side. 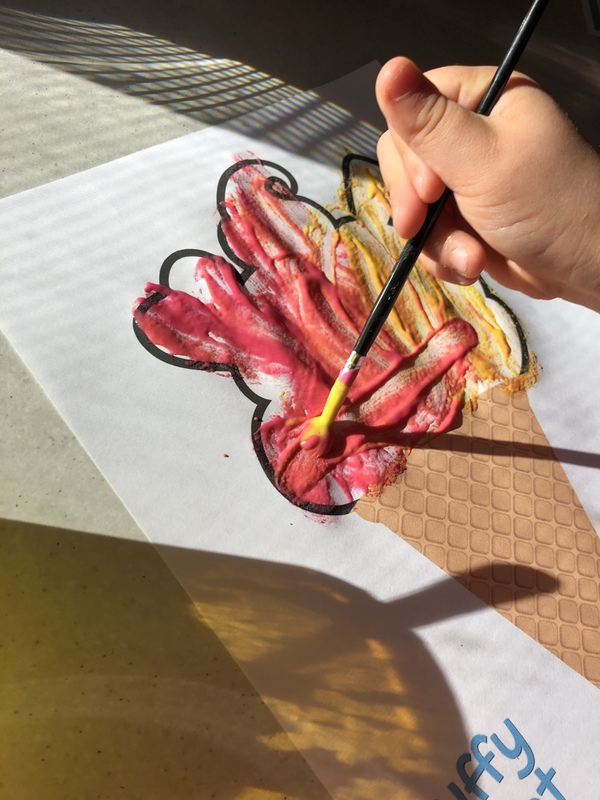 Being that she is right handed, for her to put the paint on her brush she needed to navigate her right hand across be centre of her body to the left side. This is actually a skill that needs to be practised. 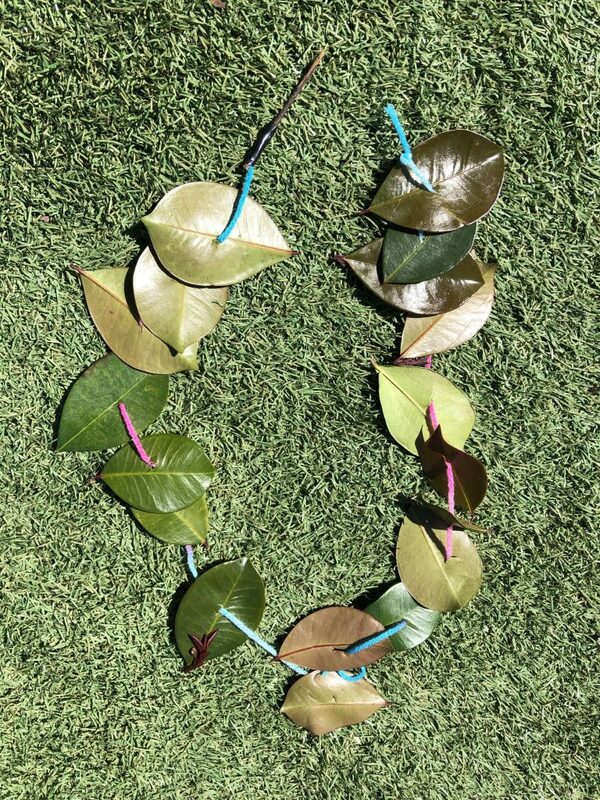 Miss 4 does struggle to do this. She will often twist and move her entire body to avoid crossing g her midline. 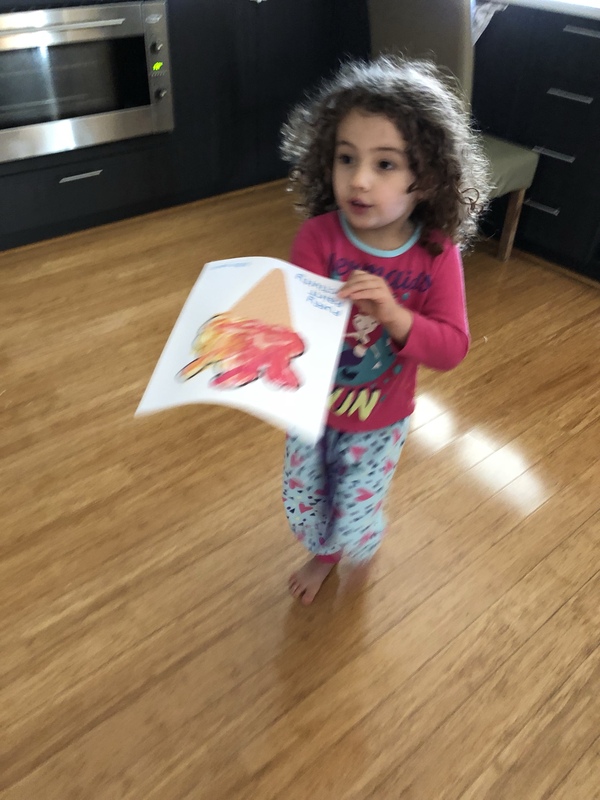 This was a great opportunity for me to encourage her to refine this important skill and she was blissfully unaware! 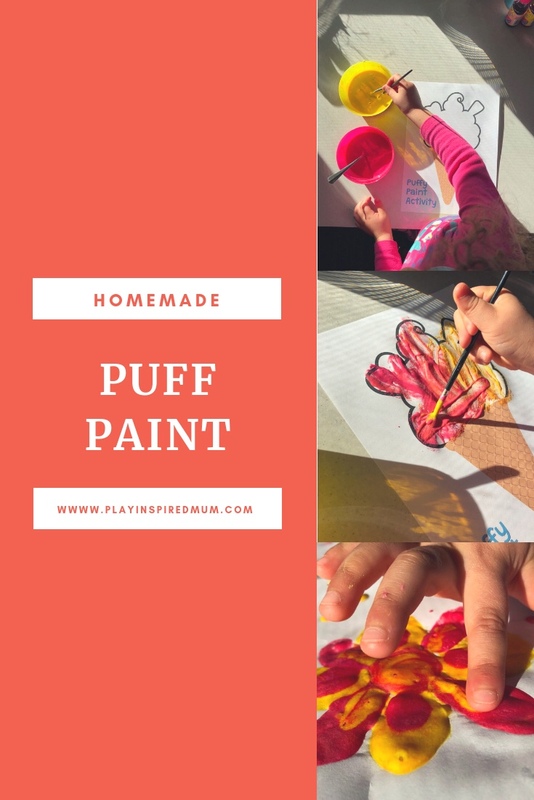 Our Puff Paint need to be applied quite heavily. 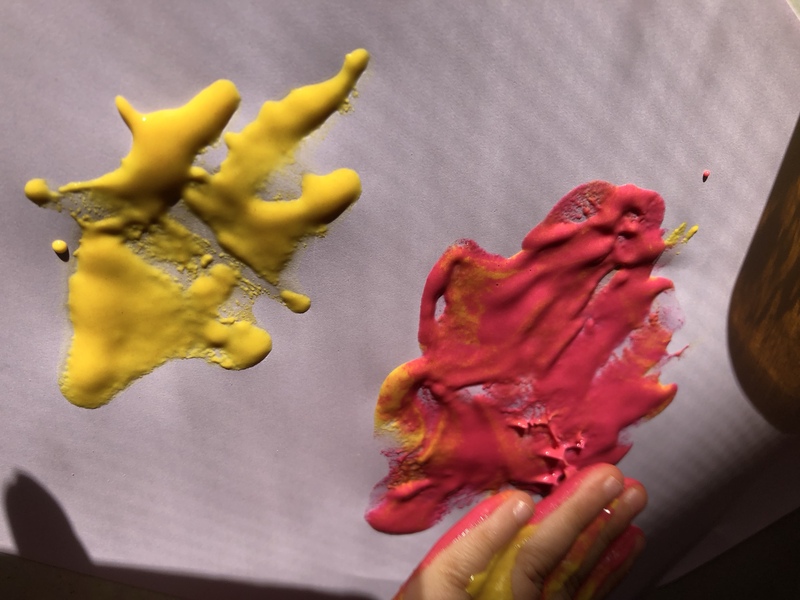 To get a great result, blobs work best! 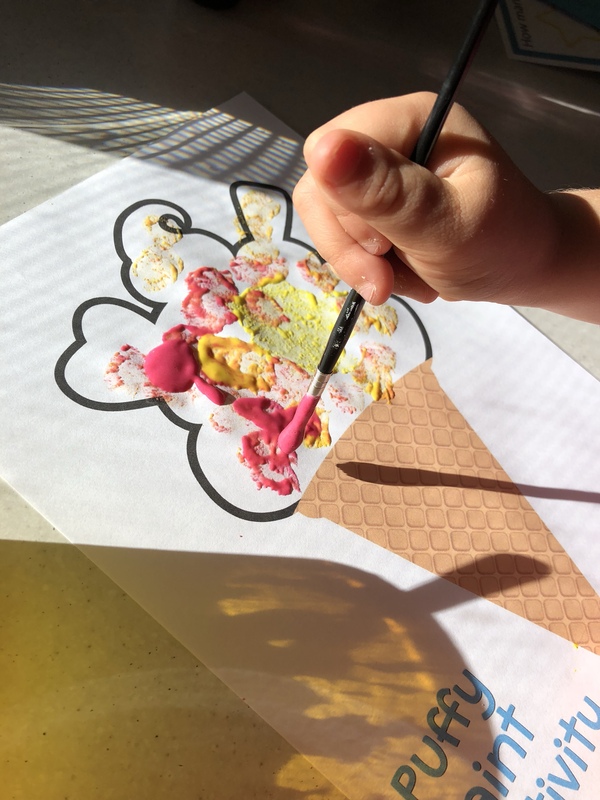 Miss 4 enjoyed laying the colours, blending, mixing, scooping and splatting. She took some time to figure out the knack but it didn’t slow her down. 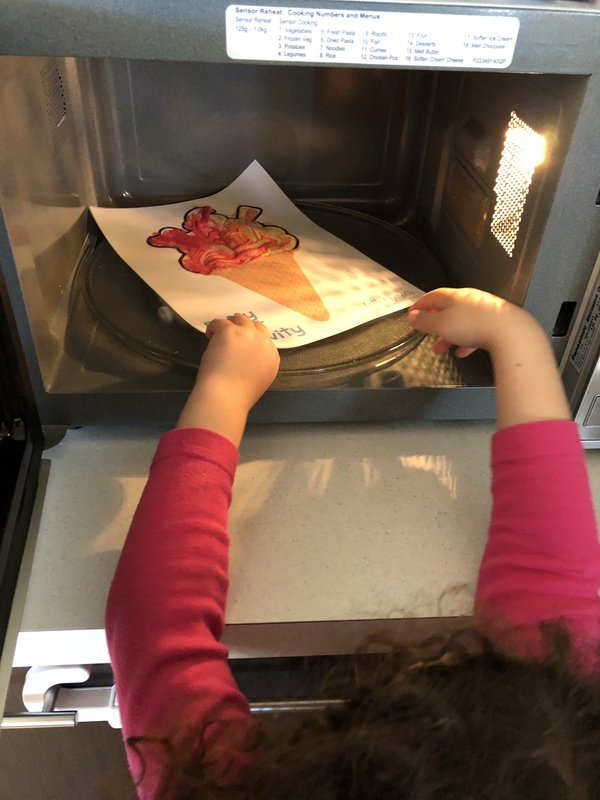 Once she was satisfied with her masterpiece, I suggested we put it into the microwave just to see what may happen. Miss 4 was puzzled- instantly a look of wonder and curiosity spread over her face. I didn’t have to ask twice though! 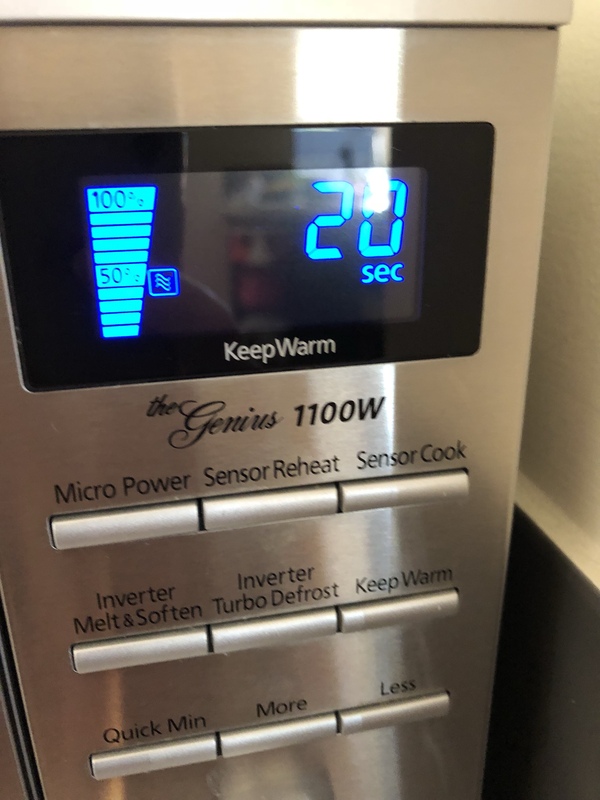 She eagerly placed it into the microwave and set twenty seconds on the clock. I swear that microwave hasn’t been watched so intently before! Both Miss 4 and myself were glued to it for those gruelling twenty seconds! Miss 4 was wondering what was going to happen and I was wondering if anything was going to happen at all! With a loud ‘beep, beep, beep’ we spring the door open and gently lifted the page off the turntable. Straight away the results were evident! The paint had risen and firmed up. 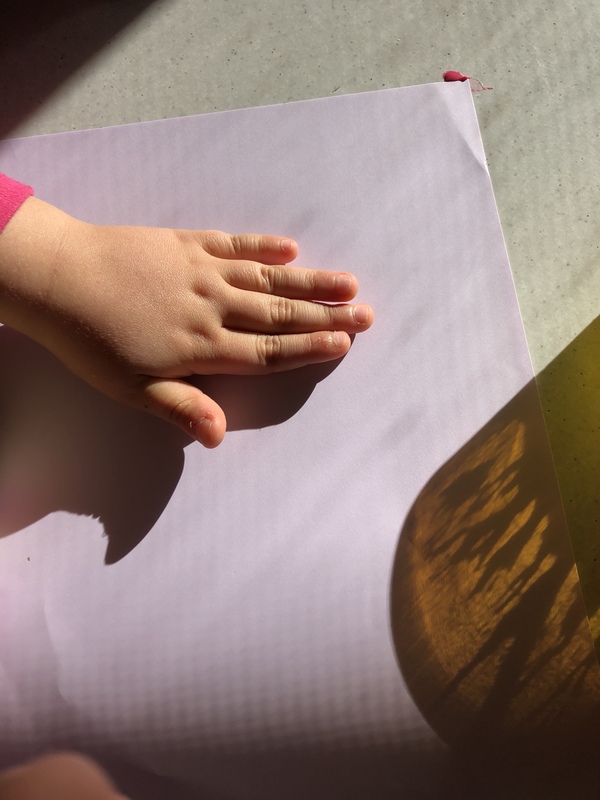 As we laid the page onto the bench, my first instinct was to give it a poke – child much? The puffed paint was slightly spongey with a little resistance. 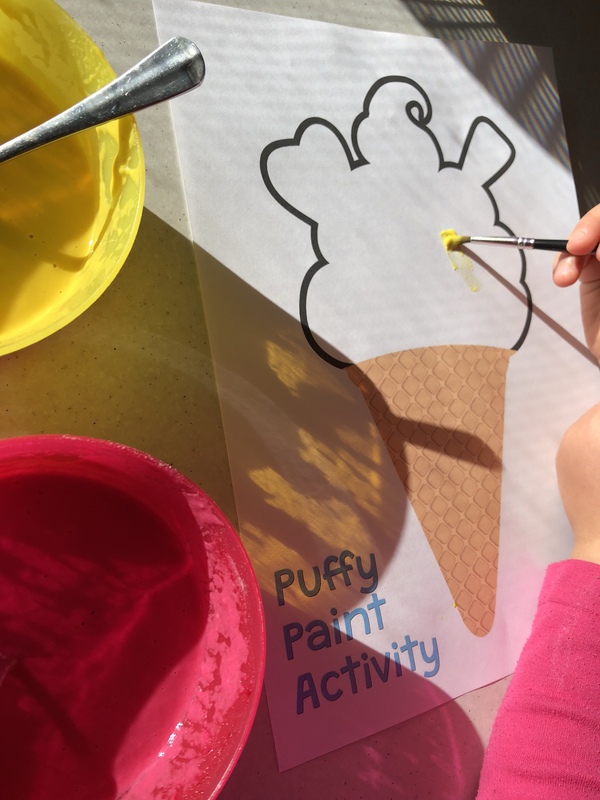 Miss 4 took it upon herself to attempt to squish all the thicker puffs. 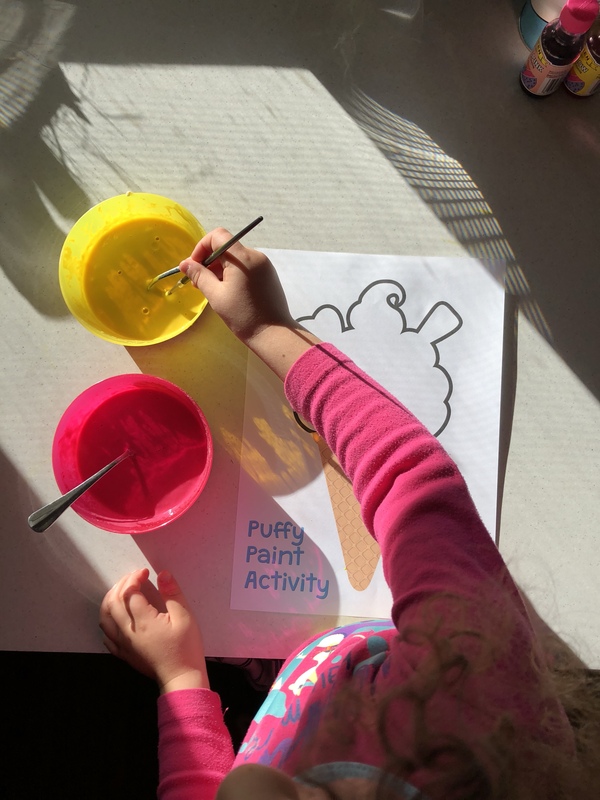 She ran her fingers over the paint which sparked a new path for our Puff Paint Activity. Before I could say anything her hands were covered in the paint. 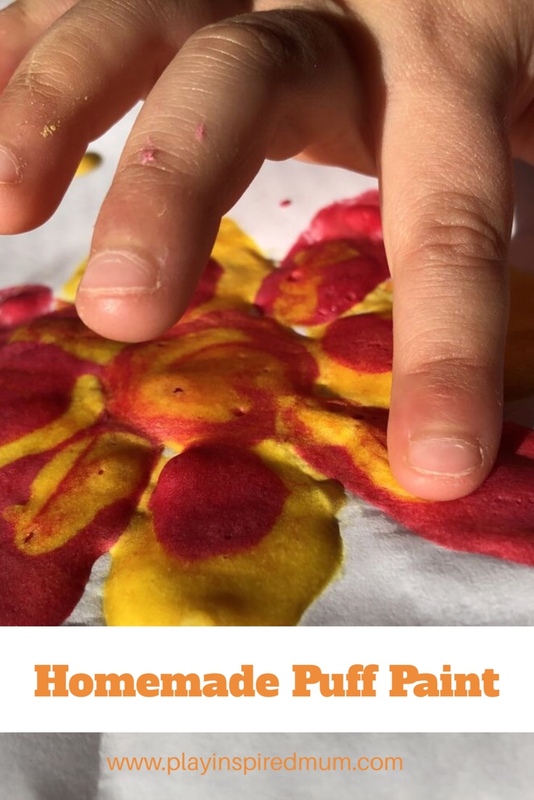 This child will put her hands into anything! 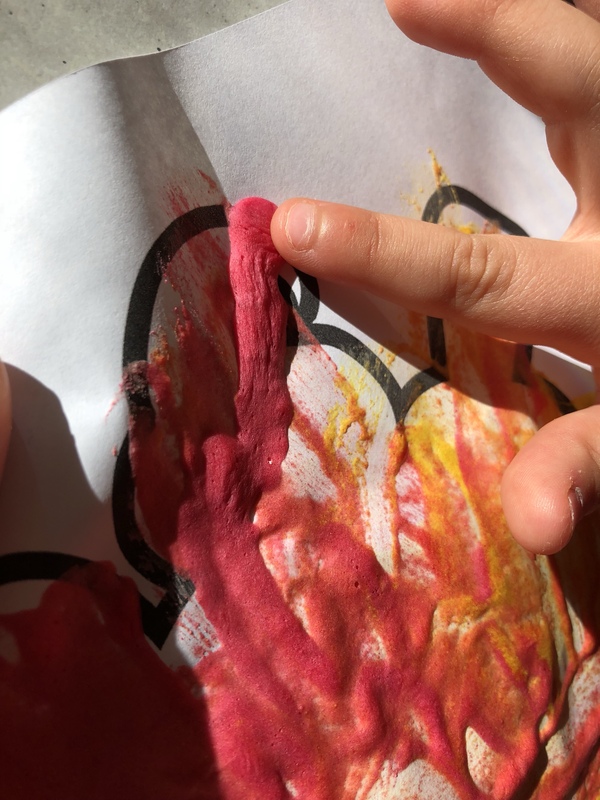 So just like that, our Puff Paint turned into Puffy Finger Paint. 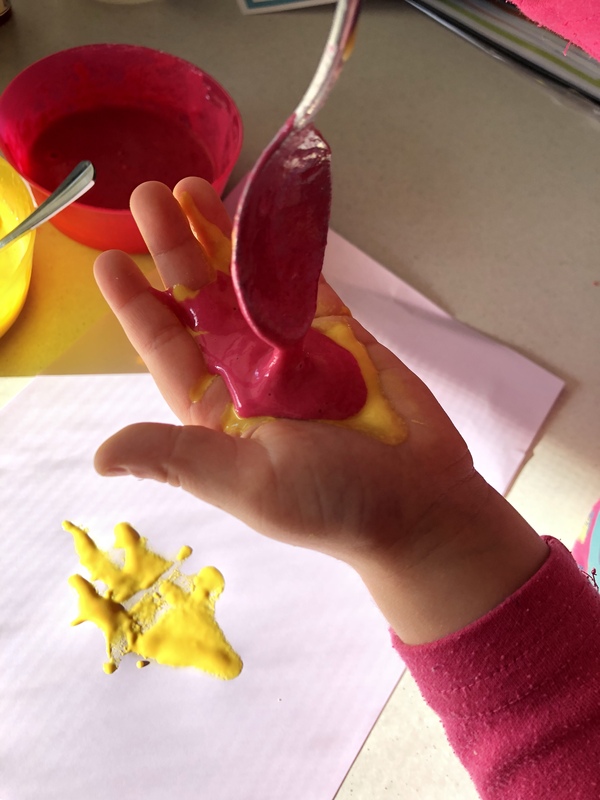 Miss 4 loved the way the paint felt on her hands and spent a lot of time running her fingers through its silky texture. This spontaneous activity was a great success! I’m sure it will work it’s way back as a regular undertaking at our place. 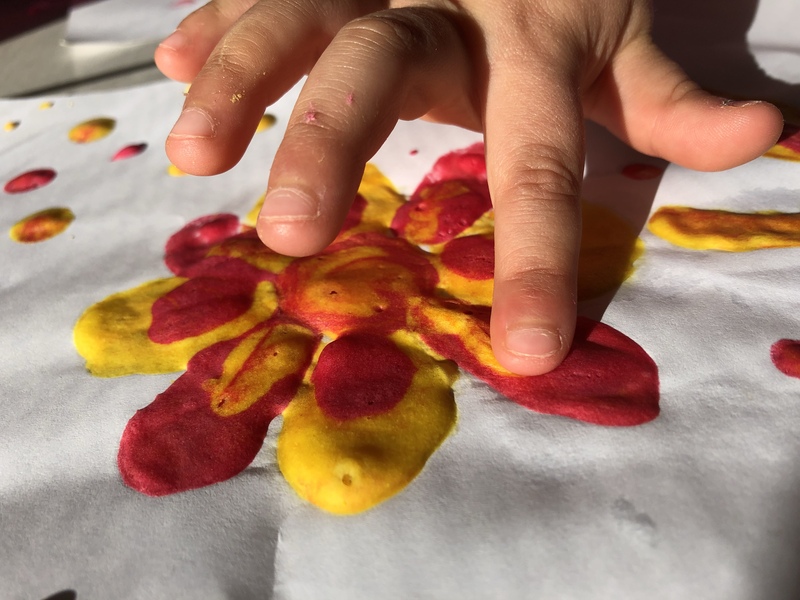 Previous ArticleSquishy Discovery Bags of Fine Motor Fun! 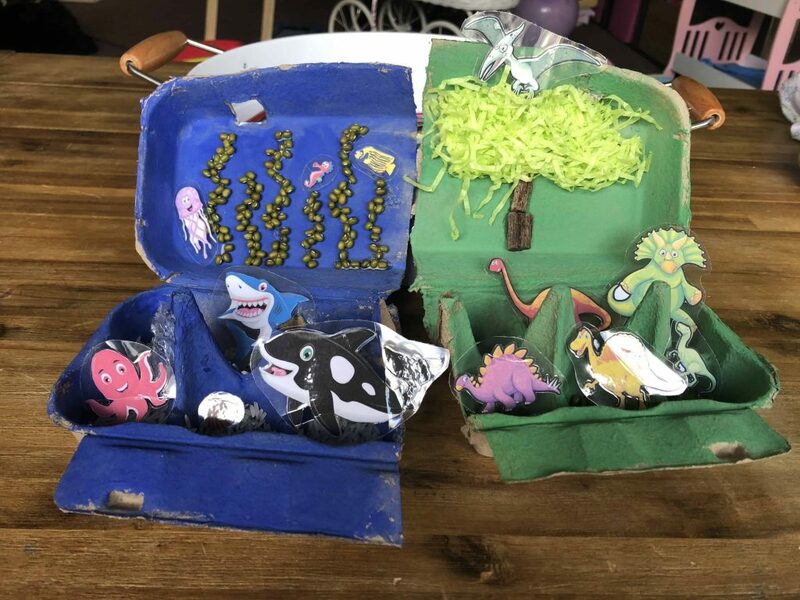 Next ArticleCreative Dinosaur Play Dough Stomp!